I got this in the mail today. I ordered it yesterday. And I got it today. Yay! Perhaps I’m the last to get on the bandwagon – which, by the way, is another great musical starring Fred Astaire and Cyd Charisse – but at least I’m here now. This was the Deal of the Day on Amazon yesterday. Yes, yes, I know…Amazon is evil! For the record, I do my best to buy books from independent bookstores or directly from publishers and authors. But, honestly, other stuff is up for grabs. I mean, come on…this was only $24.99! The price is double that today! And the regular price is around $90. I’ve seen it in the store for $100+. So, that $24.99…I just couldn’t pass that one up. But I digress. I’m not here to write about Amazon and whether it is or is not evil incarnate. No, that is not why I’m here. I’m here to talk about The Sound of Music! Oh, if there were hills in Blue Island they would certainly be alive with the sound of music. As it is, my basement is alive with the sound of my off-key singing. (It’s scaring my cats, if you must know.) Like many of you, I know all of the words to all of the songs – for both the movie and the stage version. Going into the first rehearsals for The Sound of Music was interesting. 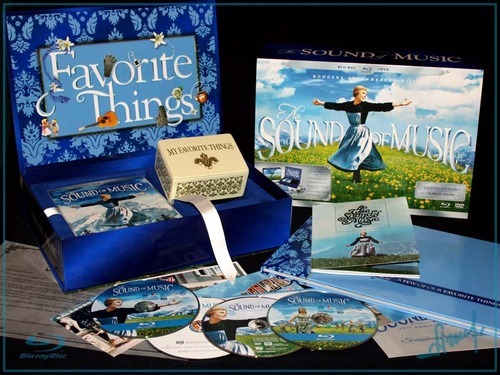 I grew up watching the movie with Julie Andrews and singing the songs from the movie – as they are sung in the movie. Then, like all rehearsals for musicals, the musical director comes in and starts going over the music and lyrics – which is also a cute movie with Drew Barrymore and Hugh Grant – and everything you thought you knew becomes useless. And for people like me, it’s even worse. So, what does that have to do with The Sound of Music? Okay, here’s the thing…many times, seeing the stage version of any musical will make me like the film version a little less. Brigadoon – Beautiful movie, but I canna’ lie to ye, laddie, the stage version is better. Even without Gene Kelly and Cyd Charisse (and her bad Scottish accent). Gypsy – I love me some Rosalind Russell. Oh, yes, I do. But her performance in Gypsy was simply atrocious. And Natalie Wood was just miscast. It was wrong, wrong, wrong. After seeing it on stage (actually, I was stage manager and costume crew for that one), the movie is even worse than I originally thought. A Chorus Line – I’m one of the few people I know who can tolerate this movie. What in the hell is Michael Douglas doing in a musical? (Terrence Mann was just about the only person who really deserved to be there. He originated the BEAST on Broadway! And played Frank N Furter on Broadway!) The stage version – much better. I’m a little biased…one of my best friends was in the show. She rocked the house! Then there’s The Sound of Music. I love the stage version. I especially love the stage version that I assistant directed. It’s a wonderful show and the music is so delightful. I still love the movie version just as much as I ever did! I still watch it every time it’s on. This movie stands the test of time. I want you to tell me. Why do you love The Sound of Music? What other musicals do you love? Do you prefer the film to the stage version? Musicals were my life for many years…sigh.